"Honor Mother Earth with Indigenous artists from North, Central & South America, the Caribbean and the Hawaiian Islands"
Shamisen master Hidetaro Honjoh offers a traditional-style concert featuring works from the hauta repertoire, the quintessential "pop music" of its time. Let this virtuoso of Edo-period love songs gently serenade and transport you to the streets of pre-modern Tokyo. The program also includes tunes from the working class of various rural areas that radiate a tender, à la mode vibe. Awarded Japan's highest honor for artists, the Medal with Purple Ribbon, Hidetaro restores gems from this fading genre of music from the end of the samurai era. Joined by Hidejiro Honjoh on shamisen and kokyu, and Yumi Kurosawa on koto. Cash bar opens at 7 pm. A pre-performance lecture begins one hour prior to the start of the performance. Tickets can be purchased Here, or by visiting/calling the Box Office at (212) 715-1258. The passionate and soulful vocalist Angelita Montoya, daughter of dancer Antonio Montoya and singer La Negra, is from one of the most famous Gypsyflamenco families, the Montoyas. Since making her debut at the age of nine in Nuevo día directed by Lole and Manuel, she has worked with Familia Montoya, Fernanda de Utrera, Chocolate, Camarón, Chano Lobato, Manuela Carrasco and Pastora Galván, among others. 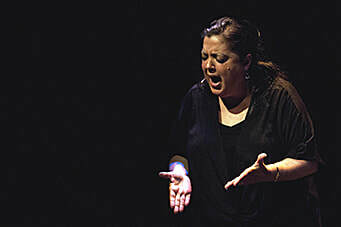 Acclaimed for her deeply expressive interpretations of martinetes, malagueñas, soleás, seguiriyas, tangos and bulerias,she has appeared at major flamenco festivals, including the Bienal de Sevilla. For this program, she will present Versos olvidados (Forgotten Verses), a 90th anniversary tribute to the women poets of the Generation of 1927 who have long been forgotten. Their poetry, now rescued, has been put to the music of Alejandro Cruz Benavides. Accompaniment by Benavides on piano and Fran Cortés on guitar. NY debut. One of Spain’s leading flamenco guitarists, Córdoba’s award-winning José Antonio Rodríguez will be making a rare New York appearance. 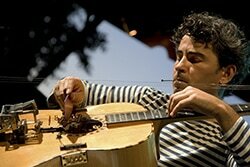 A remarkable guitarist acclaimed for his powerful and evocative renditions of contemporary flamenco, he has composed music for orchestras and dance companies, participated in major projects with Paco de Lucía and Alejandro Sanz, and appeared in Carlos Saura’s Flamenco. As a teenager in 1981 and 1982, he won first prize for flamenco guitar at prestigious contests at Minas de la Unión and Jerez de la Frontera. His recent CD, Adiós Muchachos, was declared by Spain’s El País newspaper to be the best flamenco album of 2016. For this program, he will be accompanied by Patricio Cámara “Pachi” (percussion, vocal) and Paco Peña (bass). Escape from the busy streets of New York and immerse yourself in the meditative chanting of kagura-uta (god songs) and roei (poem recitation), enjoyed by aristocrats during the Heian period (794-1185). Notable gagaku (Imperial Court music) musician Ko Ishikawaleads this introspective workshop. Max. 50 participants; no experience required. Saung Budaya is proud to present eight newly choreographed traditional dances from Papua, Borneo, Sumatra, and Java, in addition to contemporary dances accompanied by a live music ensemble from Indonesia. The title GONG, is based on the South East Asian metal percussion instrument that is hit with a mallet. Though Indonesia’s various islands have different cultures, stories, and souls, the one constant in all things music is the sound of the gong. Its distinct sound is quite deep and subtle however, it is a sound that is familiar to the people of Indonesia. Its significance in daily life is to bring communities together for a start of a celebration; in music and dance, it is the constant sound for tempo and movement. Like the gong, Saung Budaya has a similar role within the Indonesian American community. This production will showcase the different stories of these islands through the subtle yet important sounds of the gong and how it unifies Indonesian people and its various cultures. Join Gorana Dance Company as they celebrate their Ten Year Anniversary!! Ajna welcomes you to their first ever recital and showcase featuring students from their new classes this past Fall & will include our adorable Ajna Children and Ajna All-Stars. An exhibition of 100 spectacular works of gold highlighting the prosperity and achievements of 10th to 13th century Philippine kingdoms. A journey into the ancestral heritage of the phillipines through legends, epics, and myths. Families will experience and participate in dance, kulintang music and silat martial arts. An optional family -friendly tour of Philippine Gold: Treasures of Forgotten Kingdoms.